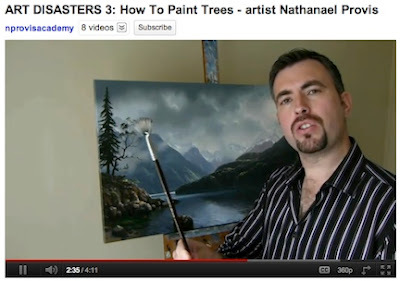 More on painting trees! 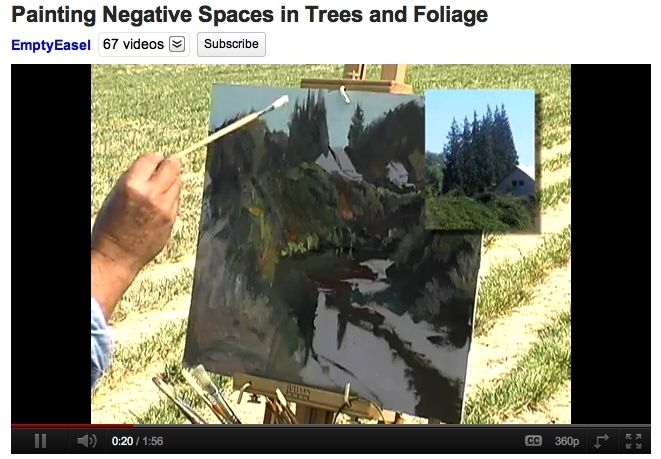 In class, I've particularly emphasized using the negative space to create the shapes of the trees. (Remember how we talked about "sky holes"?) 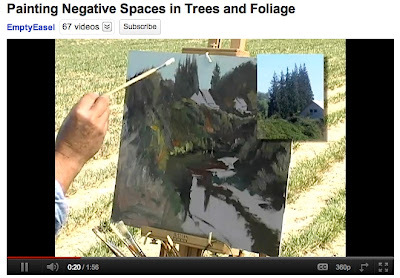 Here's a YouTube video by Craig Nelson demonstrating that – Painting Negative Spaces in Trees and Foliage. 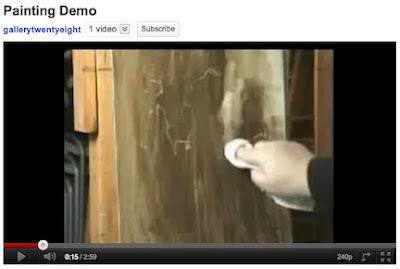 He demonstrates using a particular kind of brush - an "egbert" – also called a long filbert. Notice how very long and slender the bristles are? It gives a delicacy and flexibility to the brush strokes that he is particularly looking for. Have you been intrigued by the possibilities of block printing? (If not, I hope you will be... it is a wonderful art form to work with.) Or do you like stamping, and feel like getting more creative? Block printing is kind of a next step up from stamping – and you can combine it with acrylic painting to create mixed media pieces, something I particularly enjoy (you can see it in the painting above, Iridescence). You can also use it to print on textiles – but it stands on its own as a wonderful medium. 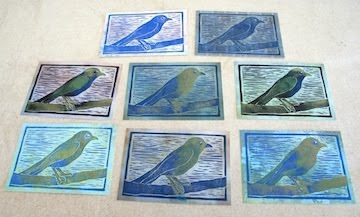 You can use it to create handprinted cards and fine art prints, which is what we'll be doing this Saturday in this year's Soft Block Printing workshop. 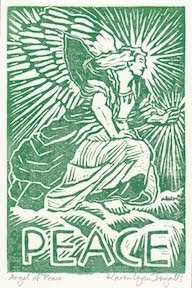 Soft block printing is similar to, but much easier to work with, than linoleum block or wood block printing. We'll also be using non-toxic, water-soluble inks, as well as safety cutters, which have the added benefit of allowing you more control of your cuts, and giving you the ability to cut much nicer curves. In the workshop, we'll design and cut the block for printing, and ink and print greeting cards and fine art prints. If you'd like to come, bring along some images you might like to make prints of – drawings? photographs? We'll be carving 4" x 6" blocks. The workshop runs from 10:00 a.m. to 5 p.m. on Saturday, August 27th, at the Calistoga Art Center, 1435 North Oak Street in Calistoga (at the Napa County Fairgrounds). Bring your lunch! You can register online at the Calistoga art center's website, at www.calistogaartcenter.org. You can also see photographs of the process from 2010's two-day printmaking workshop in my August 2010 blog post. And here's a link to Charles deLimur's block printing process, a marvelous block printing photo essay by Charles deLimur, a Calistoga artist who does Napa Valley Open Studios each year. Charley works with multiple colors and multiple printing runs, a difficult and challenging process, which he illustrates beautifully. If you click on each individual photo, you can read his commentary about the process. If you'd like to come, I look forward to seeing you! 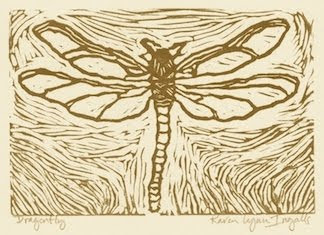 And if you're not able to join us, think about the possibilities of block printing... it's really a wonderful medium. Landscape painter Jan Schmuckal takes yet another approach to painting landscapes – and painting trees, but one that also pays close attention to negative spaces. 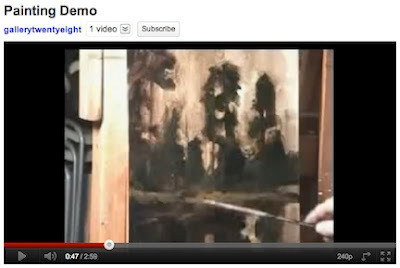 In this time-lapse demonstration video, Painting Demo, which you can find on YouTube, she begins by toning the entire canvas in a deep brown wash.
Next, she removes paint with a Q-tip, creating the basic lines of her composition. While she uses oil paints, which don't dry as quickly as acrylics, Open Acrylics, which have a longer drying time, would allow you to try this method using acrylics. Once the shapes of her composition are established, Schmuckal then comes in with a brush and paint, bringing color and increased light into the dark areas. Next she further defines the trees by painting the negative spaces around them – the sky, and its light. 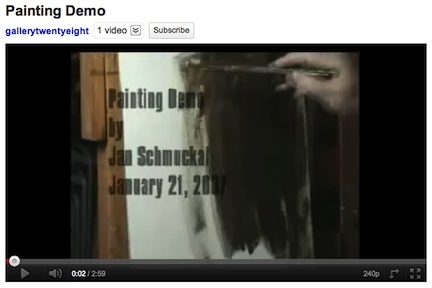 You can see the complete video at Painting Demo on YouTube, and you can see more of Jan's paintings on her gallery website (Gallery 28 in Geneva, Illinois). 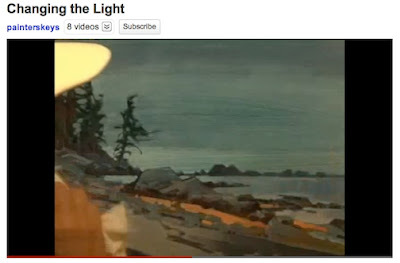 You can also follow Jan at her Facebook page, Jan Schmuckal Tonalist Impressionist Artist. You can also buy her paintings on eBay, at Gallery 28 Originals Jan Schmuckal. I hope you'll follow the links through to discover more of her work – it will be well worth your time. 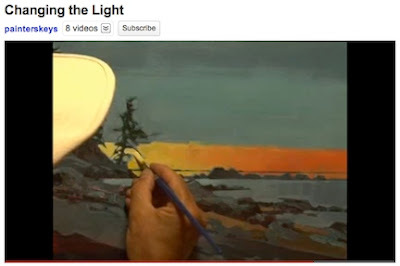 It is a joy to watch the landscape painting process of Robert Genn, a British Columbia artist who works in acrylics. 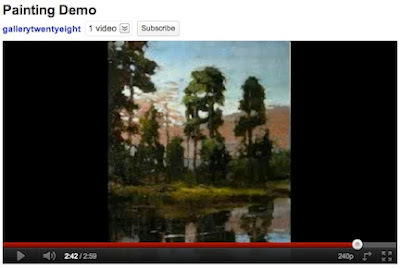 Luckily for us, he has filmed the process of creating several paintings, and shared the results on YouTube. 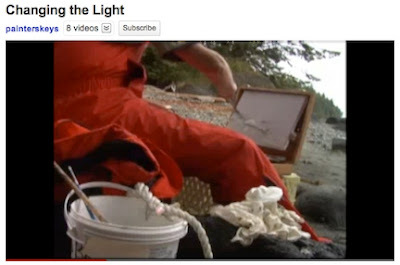 Changing the Light begins with Genn working on location on the shores of a lake. He begins to sketch the basic structures of his composition. 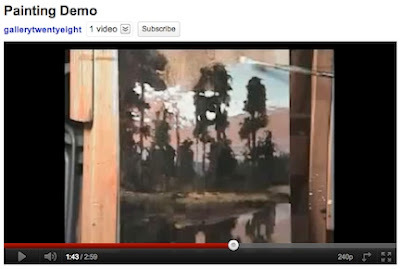 Unlike me, he does not step back and turn his canvas upside down to check the composition (it's still a good idea! ), nor does he begin with a thumbnail. 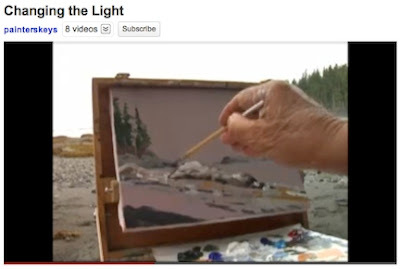 However, he has been working en plein air so long that he no longer needs what is pretty useful to many of us. 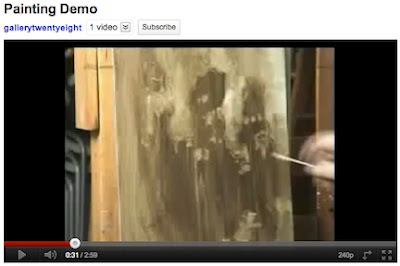 Notice that he is working on a toned canvas? In this case, it is toned a mid-gray. You can tone your canvas any color you like, if you want to try this – it is one way of pulling the colors together and harmonizing them. 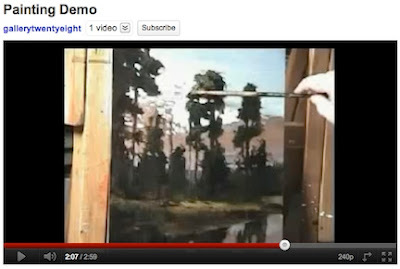 Genn then wipes a wash over the entire painting – another method of harmonizing the colors. Changing the light... a good reason for the title! Now the magic happens, when he brings sunset light into the sky (changing the light). 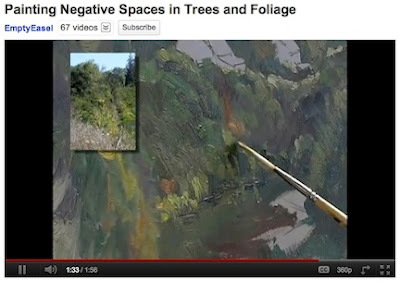 Notice how he paints the negative spaces around the tree branches? 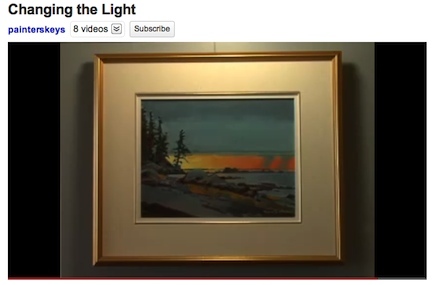 You can watch the video online at Changing the Light. 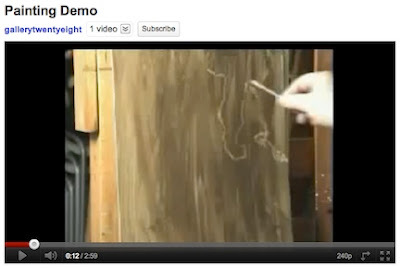 Robert Genn's username is painterskeys, and you can also watch his other videos. To study the painting of trees, I especially recommend Forest Spirit and Cuckoo. You'll enjoy his studios-on-wheels, too. 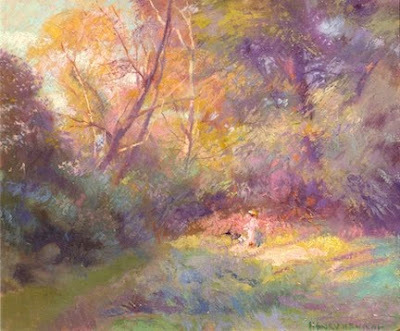 You can see more of his paintings, and learn more about him, at www.RobertGenn.com. Genn also writes a thoughtful, perceptive newsletters, with thousands of subscribers. Each week he writes two letters, and then posts some of the responses on his website. You can read them – and subscribe – at www.painterskeys.com. I've been subscribing for over ten years now, and I always learn something new. I heartily recommend it. 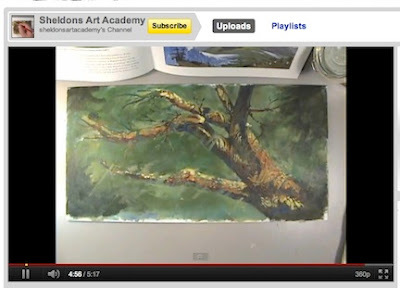 For my students who are working on painting trees, here's a great video resource online. 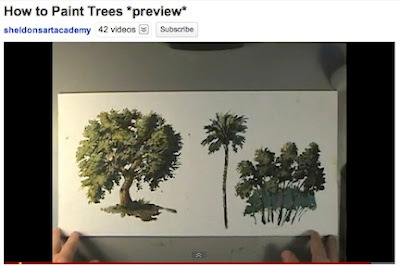 Sheldon Borenstein demonstrates how to paint an oak tree, a palm tree, and a group of trees, in his Youtube video How to Paint Trees. He develops it a little further in How to Paint Branches. They're short, succinct lessons that I think you'd find helpful. 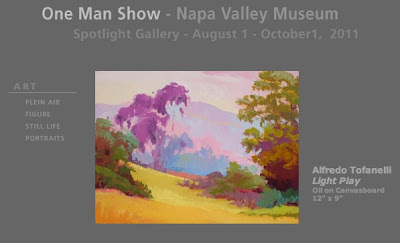 Also - THIS Saturday, Alfredo Tofanelli will be teaching a painting workshop at the Napa Valley Museum. Tofanelli is a wonderful landscape painter who works with the methods and palette of Henry Hensche, whose work you can see here. If this palette looks familiar to you, then you may have seen the paintings of Camille Przwodek, a well-known student of Henry Hensche, who lives and works in Petaluma, California, and with whom Tofanelli studied. It's a four-hour workshop for $60, and should be well worth it. Reservations are required, so give the museum a call at (707) 944-0500. I am an artist in Napa and Sonoma Counties, in California. I paint colorist landscapes of rural California, teach art classes and lessons, and live in Calistoga, California. I also teach private, group, and corporate art workshops in Napa Valley, Sonoma County, and other parts of Northern California. You can email me at karenATkarenlynningalls.com (rewritten to avoid spammers). You can also reach me at 707•942•0197. 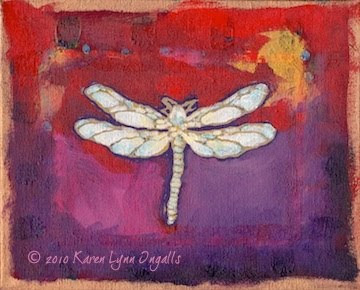 You can also see my artwork at www.KarenLynnIngalls.com.